When the elements of design, execution and surface unite, sublime magic can occur. 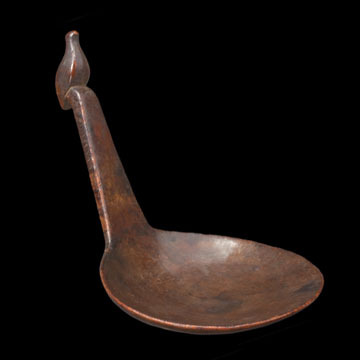 Of the hundreds of bird ladles we have documented, this example sits apart for its bold simplicity of design and masterful execution. The thinly carved bowl and proportionately flat handle lead into a slightly crooked perch, upon which a beautifully sculptured bird sits.